When all of the teeth in a patient’s mouth need to be replaced, full dentures are essential to allow for normal speaking and eating again, not to mention a more attractive appearance. Full dentures are made from acrylic and have two versions: traditional and immediate. If a patient needs full dentures while their gum tissue heals after their natural teeth have been removed, an immediate denture is used. However, traditional dentures are made after the gums have healed from the natural teeth being removed. A full denture includes an upper and lower set. The upper denture covers the palate, along with the gums, and is a flesh-colored acrylic material. The lower denture is a “U” shape that allows the tongue to function normally, and it is made of plastic and porcelain. The dentists at EMA Dental sometimes recommend an implant-retained denture for patients who need a more secure fit since it is attached to dental implants. Whether the dentures are removable or not, they do need to be replaced over time. After the original teeth are extracted, the jaw and gums slowly adjust, and with enough time, a new set of dentures are needed for a better fit. Everyday use also wears down the dentures. 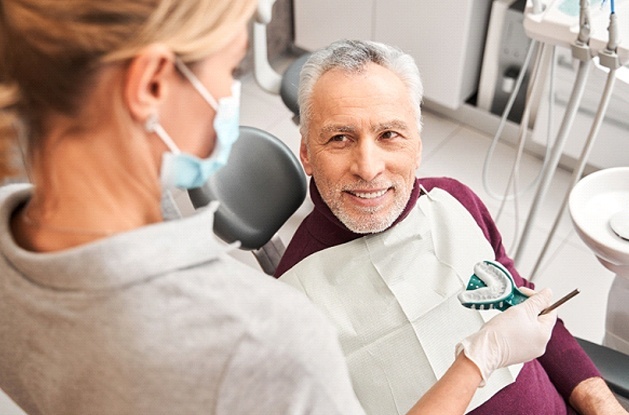 EMA Dental has several dental specialists on staff that have training and experience in helping patients who would benefit from full dentures find the best option for them. Contact us for a consultation and to find out more about full dentures.